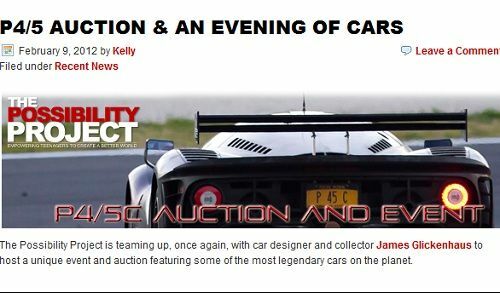 The Ferrari P4/5 race car by James Glickenhaus and The Possibility Project are teaming up to bring automotive enthusiasts some incredible prizes. The Ferrari P4/5 officially known as the Ferrari P4/5 by Pininfarina, and The Possibility Project along with Glickenhaus are hosting a very unique auction that will give automotive enthusiasts some of the best prizes they could imagine. The auction bidding will close today, March 24th at 8:00 p.m. so you will need to act quickly. All proceeds will go to benefit The Possibility Project which is a nonprofit organization operating three programs for youth in New York City. The nationally recognized program operates year-long programs that bring together diverse groups of youth from the five boroughs of New York City. The youth go through an intense year long creative process through which they write an original musical whose stories come from their lives and their ideas for a better world, and create Community Action Projects where they take those ideas and act on them to make their city better. The fun prizes that are being auctioned off to benefit the program include a pair of 24 Hours of Nürburgring experiences, one will include airfare for two, hotel, transport, and VIP all-access passes to the race. Another package in the auction will include access to the race and testing sessions along with access to the P4/5C’s private VIP lounge. This package will be not include the airfare, hotel, and transportation. But the coolest experience being auctioned off today will give someone the chance to ride in the legendary P4/5C on the open road. Also included in this package will be a personal tour of Glickenhaus’s collection of rare and antique cars. This should be one fun ride as the Ferrari P4/5 can accelerate from 0-60 mph in 3.0 seconds, which is 0.5 seconds quicker than the Enzo. And it has a top speed of 233 mph. Now that will get your adrenaline pumping. The P4/5 has the same engine as the Enzo Ferrari with 12 cylinders producing 660 horsepower and 485 pound feet of torque. The P4/5 uses the 6 speed Enzo semi-automatic transmission with black shifting paddles behind the wheel. Two other prizes that are being auctioned off also include track experiences at the famed Nürburgring race track. Both will be on VLN Endurance Championship test days along with spending time along side the P4/5C team. Trips are on March 30-31 and April 27-28 and include two pit-access tickets for both days and VIP lounge access during the race. This is an opportunity to help out a great non-profit organization and get a chance to do what every car enthusiast loves. Click here to go to the bidding. The P3, P3/4 and 412 were the prototypes that got me hooked on sports prototype. Nothing ever beat that stunning aerodynamic design. Glickenhaus' P4/5 is a sleek extrapolation that really stunned us. It's nice to see it going on the auction block. It'll be interesting to see how much it fetches.